Figure 1. Comparison of plane-polarized, crossed-nicols and optical-CL images of granitic gneiss from the Beartooth Mountains in Wyoming. Images by Darrell Henry. This photo is an image from a granitic gneiss that exhibits relict myrmekite as well as recrystallized myrmekite textures. In the optical-CL image, the blue grains are K-feldspar, the yellow-brown with reddish rims are plagioclase with albitic margins, the bright yellow grain included in the opaque grain is apatite and the dark (but plane-polarized colorless grains) are quartz. The CL image was obtained with a Technosyn optical-CL system at Louisiana State University. Optical cathodoluminescence (optical-CL) permits optical examination or imaging of a sample through the attachment of an evacuated CL-stage to an optical microscope. The CL-stage attachment uses a cathode gun to bombard a sample with a beam of high-energy electrons. 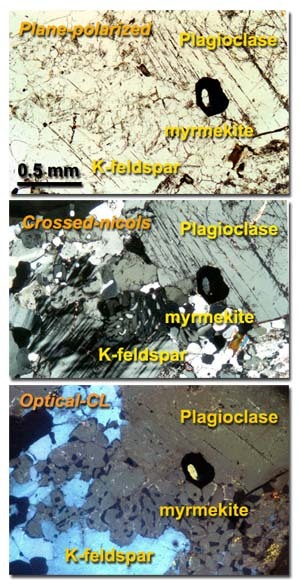 The resulting luminescence in minerals allows us to see textures and compositional variations that are not otherwise evident using light microscopy (see Figure 1). The stage allows X-Y movement of the sample to examine much of the surface area in the sample. The theory behind the production of the luminescent response by SEM-CL is the same as that for (SEM-CL) instrumentation (see CL theory). Optical-CL Instrumentation - How Does It Work? Optical-CL attachments can be categorized in two types: cold-cathode CL and hot-cathode CL. Cold-cathode CL. The most commonly used optical-CL system is termed a cold-cathode CL. It is an attachment to a microscope that allows the sample to be examined optically with the microscope and with CL in the same area. 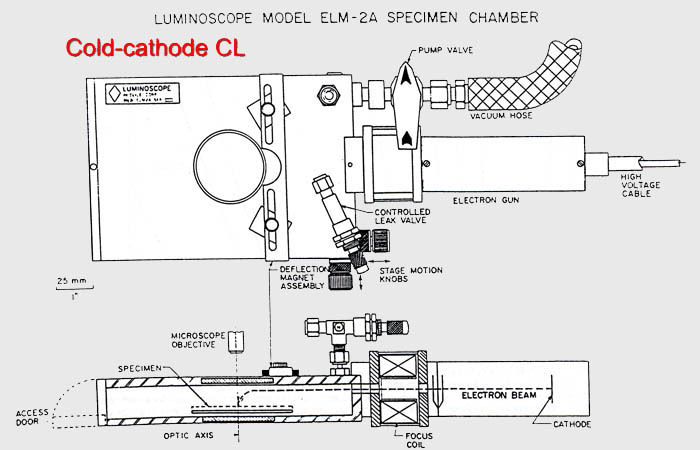 In a cold-cathode CL system the electron beam is generated by the discharge that takes place between the cathode at negative high voltage and anode at ground potential in ionized gas at a moderate vacuum of ~10-2 Torr. The result is relatively low-intensity CL in most CL-active silicate minerals. Because some of the electrical charges at the discharge may reach the sample and neutralize the static charge built up, it is not necessary to coat the sample with a conductive coating. The CL response in the sample can be viewed through the objective lens of the microscope or the image can be recorded with high-speed film or with a digital camera (Figure 2). Figure 2. Top and cross-sectional views of a Luminoscope optical-CL system that is an attachment to an optical microscope. Modified after Marshall (1988). The electron beam is generated at the cold cathode discharge point, is deflected by a magnet and encounters the sample in the evacuated stage. The Luminoscope stage was formerly manufactured by Premier American Technologies. 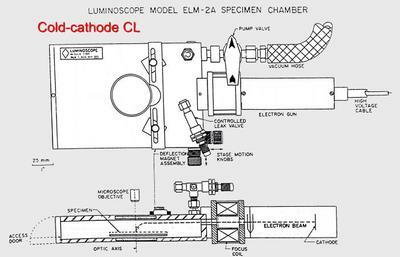 Luminoscope stage—formerly manufactured by Premier American Technologies. Technosyn stage (currently modified as the CL8200 MK5 system)—manufactured by Cambridge Image Technology, Ltd.
Hot-cathode CL.A hot-CL instrument generates the electrons by a heated filament and the electrons are directed at lower voltage toward the anode. The vacuum is generally lower (<10-5 Torr) and the accelerating potential is about 14 keV. This stage has a more stable beam and has greater CL intensity. There are several non-commercial versions of the hot-CL instrument. These instruments have higher sensitivity and the ability detect short-lived luminescence in minerals. Another form of the hot-CL instrument is the SEM-CL and will be discussed further. deformation mechanisms in metamorphic rocks.